The the FM8700 series is designed and constructed to withstand extreme wind speeds and flying debris â€” the two main threats to doors and hardware during a severe windstorm â€” and to meet life-safety code requirements for panic egress and fire resistance. 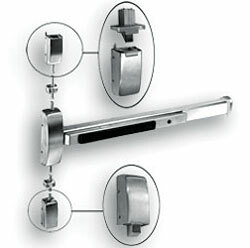 The FM8700 requires no complicated or expensive door preparation and is surface-mounted to the door. The device features specially machined rail and internal components, improving safety and durability compared to standard hardware products.